GET RID OF THE BUTTERFLIES! If you are in your teens, you have probably experienced it. You can’t sleep. You lose your appetite. Your heart rate increases, you get all sweaty and the proverbial butterflies in your stomach start fluttering uncontrollably. We know it is Valentine’s Day, but no, we are not talking about falling in love! We are talking about something debilitating, something that may pose a serious threat to your future: exam anxiety. Getting a crush on someone and feeling anxious about an upcoming test may manifest similar symptoms, but while the former is an absolutely pleasant experience, the latter is a stumbling block that could negatively affect your life. Exam anxiety can happen when students are faced with a series of exams or tests at the end of term or semester, which are usually scheduled closely together. For some people, the increased pressure around exam time may lead to them experiencing symptoms such as chest pain, dizziness and even full-blown panic attacks. In most cases, these physical manifestations are also accompanied by psychological, emotional and behavioural changes. 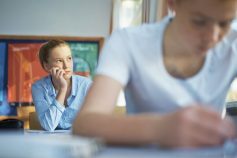 Frustration, worry, panic, hopelessness and depression are only some of the things students experience before an upcoming test. Sometimes, all it takes to get through a phase of exam anxiety is a little mindset tweak. Negative thinking will not increase your marks; it will only feed your anxiety and obstruct your memory come exam time. Worrying about unknown results is wasted energy. Instead of giving in to the temptation of entertaining negative thoughts, why not create positive ones to replace them? Focus on what you are doing right and visualise success. These will do wonders for you. One of the most effective ways to reduce anxiety is to stick to healthy sleeping habits. Develop a routine of going to bed at a reasonable time and getting a full eight hours of sleep. This means avoiding late night TV and electronic devices. Eat healthy. Aside from taking your meals regularly, it is also advisable to eat when you get hungry. This keeps blood sugar and hydration levels steady. Avoid junk food if possible. It will bring a sudden sugar high which will fall away quickly, leaving a person feeling tired. Also, cut back on coffee or any other stimulants which you may be using, as these can increase agitation. Drink lots of water instead. Regularly go out for a walk or do some other stress-busting activities you enjoy. Activities such as reading a short story may help you unwind and sleep better. It also helps to practice relaxation techniques such as listening to some gentle music, lying down after long periods of studying, closing your eyes and taking a deep breath while visualising a calming scene such as a deserted beach. Starting early with your revision is always a good antidote to exam anxiety. When you are familiar with every possible topic that may be covered during the exam, there is less reason to worry. Taking notes and checking your understanding of every subject on a regular basis will remove the necessity for a long, late night session the night before an exam, which often contributes to more anxiety. Giving yourself plenty of time will also allow you to work out a solution in case of issues that may affect your preparation. Establishing effective study and learning habits is easier when you have the support of people around you. Ask for help from your parents, a friend or a tutor. Academic Group has many programs and resources to help you with your exam preparation. We have a range of programs designed to help students reduce workload, decrease stress levels, and maximise exam marks. These include Holiday Revision Programs, Exam Boost Seminars, Tuition Help Sessions and ATAR Master Classes. Each of our programs are developed and delivered by current and experienced teachers – many of whom are textbook authors, as well as writers and markers of official Year 12 exams. Our teachers are sourced from the top performing schools across the state and are handpicked for their professional achievements and high-level communication skills.